If you were a tenor saxophonist who dreamed of stardom in the Twentieth Century your window of opportunity to maximize your chances at cutting legitimate hit records as well as influencing the direction of music overall was a fairly narrow one. Jazz had spent much of its first two decades placing the trumpet at the front of the horn section and by the time the tenor horn elbowed its way into the spotlight with the likes of Illinois Jacquet, Coleman Hawkins, Ben Webster and others, they were being challenged immediately by the alto sax brigade led by Charlie Parker. Besides, jazz was always more of an ensemble style of music wherein each band member would take a solo and then pass the baton to another instrument. Musical democracy in action. But where democracy might be good in the world of politics ensuring that each voice is heard, musicians seeking glory tend to prefer a touch more autocracy, so the up and coming tenor saxmen looked elsewhere for their best chance at getting noticed and soon found it in rock ‘n’ roll of the late 1940’s. No other instrument defined early rock like the tenor saxophone with its rough and tumble image, its lusty tone, and its ability to sound downright crude in its lower register and orgasmic in its upper range. No instrument as of yet also provided quite the showmanship aspect of the sax on stage, where its owner was free to roam, no wires to worry about getting tangled or severing the connection to an amplifier, for no amp was needed for them to be heard. They could stand on tables and walk along the bar, or go into the crowd and feel the adulation of the audience who swarmed around them. They could lay on their back on stage and blow to the heavens, or – in some documented cases – even head out the door and down the street, blowing up a storm and leading the masses like a devilish pied piper. The tenor sax was unquestionably the dominant rock ‘n’ roll instrument of 1948 and 1949, the centerpiece of records from across the spectrum, be it instrumental showcases or backing a vocalist with a dazzling solo, and its popularity showed no signs of abating. Though we’ve met a fair number of self-contained bands, albeit few who were credited on a record label as such, one on the West Coast was shaping up to be quite potent in what they had to offer even though as of yet they’d yet to offer us a genuine hit on their own. Those who’ve been with us from the start need no reminding Johnny Otis was a drummer who’d come up with the territory bands of the 1940’s playing swing music early on before his move to Los Angeles where he took over the house band for the Club Alabam which required a much smaller, tighter group capable of delivering a more cutting edge sound by mid-decade. Though vestiges of the larger ensemble remained, such as their reliance on the trumpets to lead the massed horn section when playing in unison, Otis soon learned what instruments packed the biggest wallop. He recruited Pete Lewis to play a snarling electric guitar, Devonia Williams to boogie away on piano, plus the human rhythm machine Leard Bell to take over for Johnny himself on drums when a hand injury moved Otis off that instrument. But he also had the services of not one but TWO of the most ferocious tenor sax monsters in the land and that, as much as anything, assured his entry into the national sweepstakes. One was Big Jay McNeely, who while never an official member of Otis’s band sat in on countless sessions and live gigs and cemented his growing reputation with some of the most blistering performances ever captured on wax. The other – and more permanent – tenor sax star behind Otis was his friend from way back in the day when both were feeling their oats in those fabled Midwest territory bands, James Von Streeter. 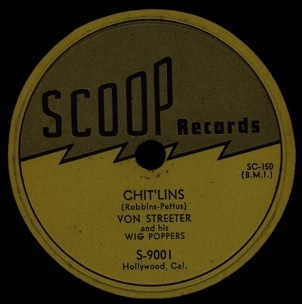 Considering the need that independent record companies had for tenor sax virtuosos who could reliably deliver the attributes that he personified – power, precision and execution – it shouldn’t be surprising that Von Streeter got his chance apart from his work behind Otis to make a name for himself. As we saw firsthand when we met him a few months back on Landslide, he was all that he was cracked up to be and then some. But as good as he was and as important a role he’d go on to play in Otis’s crew for years, James Von Streeter for some reason never became a star. He played the right instrument at the right time in the right style to connect, but that type of solo success that McNeely and so many others achieved somehow remained just out of Von Streeter’s grasp. Even though the primary artist gets their name printed in bold type on the record label, not to mention adorning the top of these pages when those records come up for review, they’re ultimately only one element of a record’s success. They may be the most important one for sure but they’re rarely the deciding factor as to its worthiness, not when you have a band surrounding you who contribute just as many notes to the arrangement as their leader. That’s the stumbling block facing so many artists, especially in rock’s first few years when the one signed to the contract has a clear vision he wants to follow but the others can’t seem to see the light, which is the case on Chit’lins, a record suffering from a split personality among its musicians. Sure enough Von Streeter’s tenor sax has absolutely no problem doing what is expected of him, the first sounds emanating from his horn are emphatic, shocking and frankly a little bit obscene. He rises, falls, stretches notes and plays one quick riff in the midst of all this which is sultry and seductive… and we’re only six seconds into the song!!! He almost convinces you his lungs must be made of elastic the way he can blow so many different ways in such a brief span and considering that his previous effort Landslide, was as solid an instrumental as could be found of late you’re ready envision Von Streeter taking his place at the front of the line from here on in. But the other horns quickly dissuade you from that thinking when they immediately drag him back down to earth with an odd blaring group refrain which is too brassy and too classy, or at least too artificial sounding, to make you think they belong on the same record. I suppose it’s got its roots in jazz, which let’s face it is the world they all came from originally, Von Streeter included, but it seems to be more like a second rate show-band style of jazz, as if they were using the horns to announce the arrival of the emcee for an evening’s performance of dancers, comedians and acrobats. It’s the sound of contrived fanfare, the type of thing that has you looking around to see what inconsequential king with a big ego who hails from a small country just came through the doors. This duality creates a major conflict that sends the record into disarray. 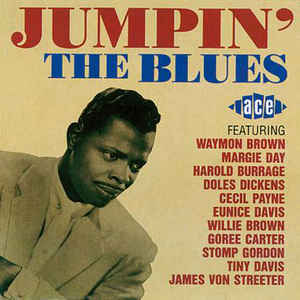 While those other horns are playing blandly swinging riffs with clipped precision, trying not to crease their dinner jackets in the process, Von Streeter swaggers back in sounding as if he’s coming off a three day bender and is trying to knock them from the bandstand by the sheer force of his horn alone. Neither side gives an inch though and the resulting section sounds like the proverbial radio tuned to different two stations, about all that’s missing is the static as the single bounces between the two. If suddenly a Spanish language news bulletin or a commercial for discount tires came across the airwaves you wouldn’t be at all surprised. Only the drummer isn’t taking sides here, playing at a steady clip while eyeing both the clock and the door to make a quick getaway if the two factions start throwing hands. Oh by the way, did we mention that we aren’t even a minute into the proceedings? As if that war of the worlds between two divergent musical mindsets wasn’t enough to digest the main course is still coming up, as the instruments suddenly drop out, a band member, sounding somewhat dignified even as he is pretty assertive in telling the others not to stop, is immediately responded to by what can only be described as a drunk stumbling out of – or into – the club’s elegant kitchen where he hollers at the line cook to to start boiling those chitlins. As if the place where the rest of this dainty band is employed knows HOW to cook chitlins, let alone has them on the menu! But perhaps the cry for such a working class delicacy has not only frightened off the regular constituency of the place, but also the black tie clad horn section that was such a blight on the first section of the song. Von Streeter now has center stage to himself and while that is certainly welcome we have a new problem to face, namely the fact that what he’s playing now is nowhere near as compelling as what he was playing when he had to compete with the honor guard band earlier on. He blows hard and long but without much melodic direction which means the mid-section wanders in search of a hook. There’s a nice backbeat provided by drums and handclaps, even some guitar accents and eventually a few cries of encouragement from others, but it’s not all it could be until Von Streeter himself hands off to the baritone which gets a brief, but welcome solo of its own. By now the other horns, having probably gobbled up the Chit’lins in the interim and like Popeye with his Spinach feel the power of this unique cultural delicacy surging through them, start to return with more appropriate behavior, or should we say misbehavior if judging it by the standards they were expected to uphold at the start. At this point it all descends into near anarchy. They may all be on the same page in terms of intent by now – finally – but they’re hardly playing in cohesion with one another. It still is a vast improvement over the stylistic clashing that dominated the first minute and so you’ll be happy to lose your mind along with them if you’ve just wrested a table away from a shell-shocked couple in from Palm Springs who are now fleeing in terror at the mayhem on stage that threatens to spill onto the floor, but even you, rock ‘n’ roll enthusiast that you are, won’t be able to make much sense of this when all is said and done. These kind of roof-raising workouts are obviously much harder to competently pull off than they probably appear at first glance. Though they need to give off an unruly vibe to get your heart racing, head bobbing and feet moving there’s a very thin line between being rowdy and being messy and this leans strongly towards the latter. If they wanted to present a more orderly structure early on so that midway through they can blow that all to hell when they start to cut loose that’s certainly a good approach to take, but it requires James Von Streeter himself to lay back at first, if not sit out altogether, until that explosion hits. At the very least he’s got to sound like he’s being reined in, playing brief, slow, sultry lines in between the brash group horns, as if he’s looking for an opening to bust out but can’t quite find it until that mid-song break. Instead he’s going full-tilt right away, which features his best playing but which accounts for the worst part of the arrangement. When the arrangement improves as the other horns drop out that’s when Von Streeter’s creativity wanes and it’s left to the others to pick things back up again in the closing stretch. Chit’lins still might satisfy most rock fans for the sheer bedlam it creates, as this is definitely one of the louder and more rambunctious instrumentals we’ve heard, but it’s nowhere near one of the best. You can’t count them out just yet though because they’ve all shown they can play, and even here they all chip in with something that sounds really good, it just doesn’t all sound really good at the same time. So chalk this one up as just a way for them to try things out, to see what fits and what doesn’t, what needs to be tightened up and what needs to be thrown out. Whatever you have left over, provided you can put all the pieces together again, might wind up being a helluva good rock record. 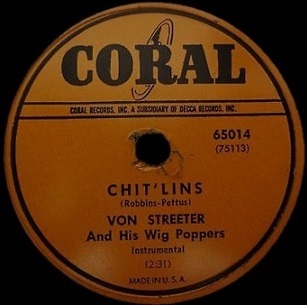 Leave a reply on "James Von Streeter & His Wig Poppers: “Chit’lins”"